In September 2018 I attended the CAMPUS LAAAB. Iberoamerican conference of citizen innovation, where I presented a first draft of the strategy of citizen participation of the newly created directorate general of the Catalan government. The video and slides of the session can be watches or downloaded, respectivelly, at Fomento de la participaciÃ³n democrÃ¡tica no formal e informal. De la democracia de masas a las redes de la democracia . Now, the Government of Aragon has published a book collecting all the speeches of the event. Abrir instituciones desde dentro. Hacking inside black book [Opening institutions from within. Hacking inside black book] features 17 different initiatives from 20 different authors, ranging from living labs to institutional change, but always under the general topic of citizen innovation through citizen democratic engagement. 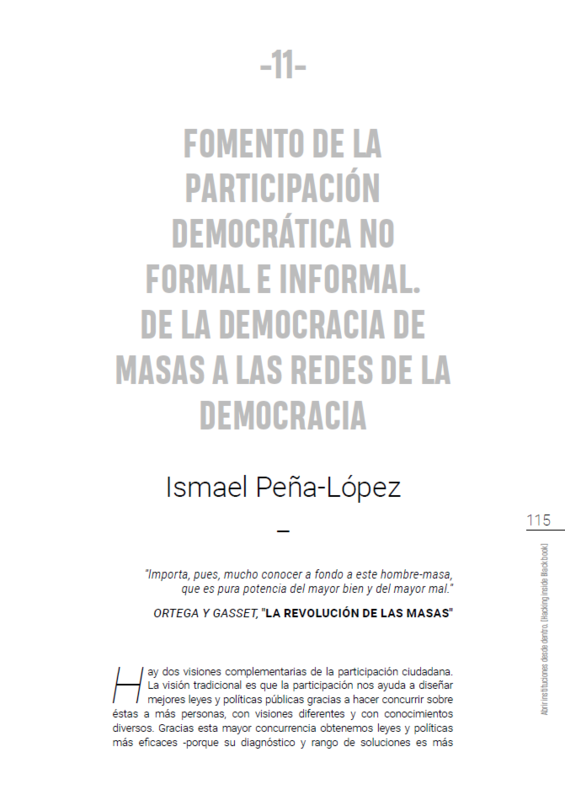 My chapter, Fomento de la participacioÌn democraÌtica no formal e informal. De la democracia de masas a las redes de la democracia [Fostering non-formal and informal democratic participation: From mass democracy to democracy networks] explains why and how the Catalan government aims at using citizen participation to transform the Administration with a higher goal: contributing to stop populism by helping citizens to understand politics… and using this higher goal to deeply transform how the Administration approaches citizens and how the monopoly of decision-making can be shared with them. The whole book is in Spanish. See below the abstract of my book chapter and the book as a whole. Hay dos visiones complementarias de la participaciÃ³n ciudadana. La visiÃ³n tradicional es que la participaciÃ³n nos ayuda a diseÃ±ar mejores leyes y polÃ­ticas pÃºblicas gracias a hacer concurrir sobre Ã©stas a mÃ¡s personas, con visiones diferentes y con conocimientos diversos. Gracias esta mayor concurrencia obtenemos leyes y polÃ­ticas mÃ¡s eficaces -porque su diagnÃ³stico y rango de soluciones es mÃ¡s ajustado- y mÃ¡s eficientes, dado que se incrementa el consenso, se reduce el conflicto y el diseÃ±o es tÃ©cnicamente mejor. Esta visiÃ³n que podrÃ­amos adjetivar de esencialmente tÃ©cnica puede complementarse de otra visiÃ³n mucho mÃ¡s filosÃ³fica o incluso polÃ­tica en el sentido de transformaciÃ³n social a travÃ©s de las ideas. Esta segunda visiÃ³n es que la participaciÃ³n de carÃ¡cter deliberativo podrÃ­a constituir una suerte de tercer estadio de la democracia, tomando lo mejor de la democracia griega (directa) y la democracia moderna (representativa), a la vez que contribuye a suplir las cada vez mÃ¡s manifiestas carencias de ambas: por una parte, el coste de participar; por otra parte, la creciente complejidad de las decisiones pÃºblicas. No obstante, este tercer estadio, dada su naturaleza deliberativa, por definiciÃ³n debe darse en nuevos espacios y con nuevos actores, a incorporar al actual diseÃ±o de la prÃ¡ctica democrÃ¡tica centrado casi exclusivamente en las instituciones. PeÃ±a-LÃ³pez, I. (2018). “Fomento de la participacioÌn democraÌtica no formal e informal. De la democracia de masas a las redes de la democracia”. In Laboratorio de AragÃ³n Gobierno Abierto (Ed. ), Abrir instituciones desde dentro. Hacking Inside Black Book, CapÃ­tulo 11, 113-124. Zaragoza: LAAAB, Gobierno de AragÃ³n. La sociedad de masas de las primeras revoluciones industriales ha dado paso a una sociedad de multitudes. La democracia representativa y las organizaciones de intermediaciÃ³n conviven ahora con redes distribuidas, desde donde la ciudadanÃ­a digital reclama una participaciÃ³n mÃ¡s directa y anhela una relaciÃ³n mÃ¡s horizontal con las instituciones. En los Ãºltimos diez aÃ±os han brotado movimientos cÃ­vicos en casi todas las regiones del planeta que reclaman la apertura de los gobiernos. Las estrategias de participaciÃ³n y transparencia en torno al paradigma del gobierno abierto, inauguraron nuevas cartas de servicio en la Ãºltima dÃ©cada, pero han ido surgiendo otras formas de hacer, otras metodologÃ­as, que experimentan con aumentar el rol de los ciudadanos en los asuntos pÃºblicos, y que agrupamos a modo de sÃ­ntesis en el concepto de innovaciÃ³n ciudadana, donde se integran tambiÃ©n proyectos que exploran los lÃ­mites de la innovaciÃ³n social, la ciencia ciudadana o el diseÃ±o abierto y colaborativo. El Gobierno de AragÃ³n, en pleno proceso de impulso del Laboratorio de AragÃ³n Gobierno Abierto (LAAAB), quiso reunir a algunos de los tÃ©cnicos y teÃ³ricos de estas nuevas formas de hacer, de pensar y de participar, referentes de toda IberoamÃ©rica, para contribuir desde su experiencia a la reflexiÃ³n global. Tuvimos la suerte de poder reunir a todos los participantes de este libro, una veintena de personas que consideramos referentes en sus respectivos campos, y que conforman una buena muestra de lo mejor que se estÃ¡ haciendo en LatinoamÃ©rica y EspaÃ±a en el amplio universo de la innovaciÃ³n ciudadana. Todos los ponentes cedieron sus ideas para la publicaciÃ³n del libro que aquÃ­ se presenta: Abrir instituciones desde dentro [Hacking Inside Black Book]. Laboratorio de AragÃ³n Gobierno Abierto (Ed.) (2018). Abrir instituciones desde dentro. Hacking Inside Black Book. Zaragoza: LAAAB, Gobierno de AragÃ³n. Peña-López, I. (2018) “Book Chapter. Fostering non-formal and informal democratic participation: From mass democracy to democracy networks” In ICTlogy, #183, December 2018. Barcelona: ICTlogy. A couple of years ago I attended a workshop at the European University Institute, Shaking the brick and mortar: moving higher education online, where I presented Opening up the gates: scaffolding lifelong learning. The reflections on that workshop have now been published as a book: Higher Education in the Digital Age. 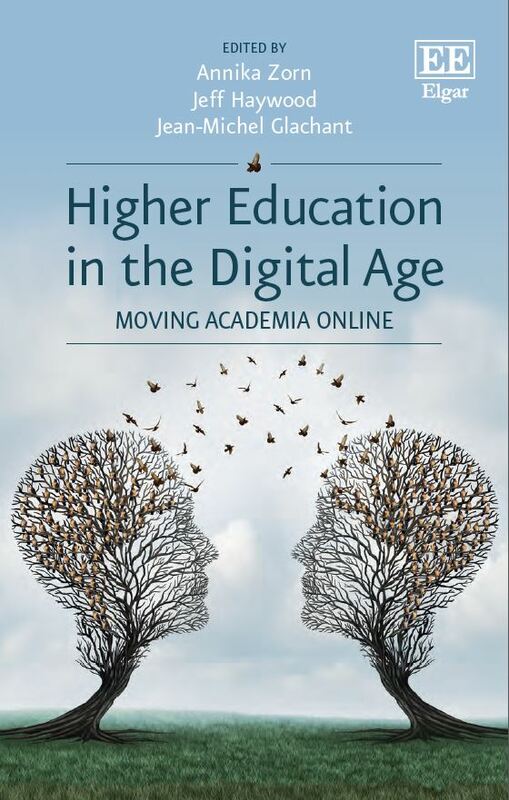 Moving Academia Online , edited by Annika Zorn, Jeff Haywood, and Jean-Michel Glachant. I have contributed to the book with chapter 3, Translearning: unfolding educational institutions to scaffold lifelong networked learning . The whole book can be downloaded in preprint format. Please find below the abstracts and links to download both my chapter and the whole book. Most works on instructional technology focus on the potential â€“ and sometimes weaknesses â€“ of technologies to do certain things. This chapter will take the opposite approach: we will be looking at 10 different â€œinstitutionsâ€ in education (the school, the classroom, the textbook, the library, the syllabus, the schedule, the teacher, evaluation, certification and the curriculum) and see how, on the one hand, digital technologies are challenging the foundations of such institutions and, on the other hand, how they can strengthen their role in education by unfolding their reach and scope. Ours is, thus, an approach that focuses on transformation of institutions by pushing them outside of their formal education framework and into lifelong learning by being part of learnersâ€™ informal educational networks. PeÃ±a-LÃ³pez, I. (2018). â€œTranslearning: unfolding educational institutions to scaffold lifelong networked learningâ€. In Zorn, A., Haywood, J. & Glachant, J. (Eds. ), Higher Education in the Digital Age. Moving Academia Online, Chapter 3, 55-82. Northampton, MA: Edgar Elgar. Higher Education in the Digital Age offers readers a comprehensive overview of the ways in which a move into online academia can be made. Analysing successful case studies, the original contributions to this timely book address the core activities of an academic institution â€“ education, research, and research communication â€“ instead of focusing only on online learning or digital strategies relevant for individual academics. Chapters cover online and networked learning, as well as the myriad ways in which the digital age can improve research and knowledge exchange with experts and society more widely. All other information can be found at the official website of the book. Peña-López, I. (2018) “Book Chapter. Translearning: unfolding educational institutions to scaffold lifelong networked learning” In ICTlogy, #183, December 2018. Barcelona: ICTlogy. Whenever the performance of teachers in educational centres is evaluated, teacher training appears as a key issue. And it is crucial, simplifying, in two areas. On the one hand, as an indicator of the teacher’s level of competency updating, that is, for their evaluation and professional accreditation. On the other hand, as an instrument for this teacher to expand their toolbox and apply it in their day to day with their students. Without aiming at judging here the effectiveness and efficiency of the various initiatives that are currently under way in terms of teacher training, what is true is that most of them have pivoted on institutionality and training. By institutionality we mean that they must begin and develop from certain institutions, be scheduled well in advance, have a certain structure and duration or teaching load and, above all, be recognized as such, that is, as teacher training initiatives within a determined scheme of the Administration. By training we understand, precisely, the high formal component of these initiatives and that, by construction, leaves out a very wide range of initiatives and learning opportunities that occur in the margins of the established system of teacher training. There are reasons for this to be so and we do not want to open this space now to discuss them. Surely we would agree: guarantee a certain quality, avoid fraud (especially economic), etc. But, that we aim at guaranteeing these principles does not mean that there is only one way for our teachers to learn. Moreover, it begins to be highly dissonant that, while we affirm that an era is opening where it is important to learn to learn, where it is essential to learn throughout life, where we must give tools to our students to be autonomous in their learning (present and future), we keep formal teacher training ase the only practical option: closed initiatives, circumscribed to a time and a space, and highly directed, prefabricated and unidirectional. Outside the radar of the traditional teacher training, many educators begin to organise themselves in communities of practice and learning (virtual or face-to-face); share doubts and resources in their blogs; participate in edcamps, workshops, webinars or educational hackathons; carry out innovative projects that open up the educational community, and a long list of examples that begin to be not an exception, but a real trend that does not stop winning critical mass. Are we capable of recognizing and, above all, fostering this type of learning, of high value (because it is not individual, but collective! ), but that systematically falls outside what we have usually understood as training of trainers? Post originally published on 28 February 2018, with the original title De la formaciÃ³ de formadors a lâ€™aprenentatge de formadors in Edubaromentre.cat. All articles published in that outlet and republished here can be read in English at edubarometre. Peña-López, I. (2018) “From teacher training to teacher learning” In ICTlogy, #174, March 2018. Barcelona: ICTlogy. 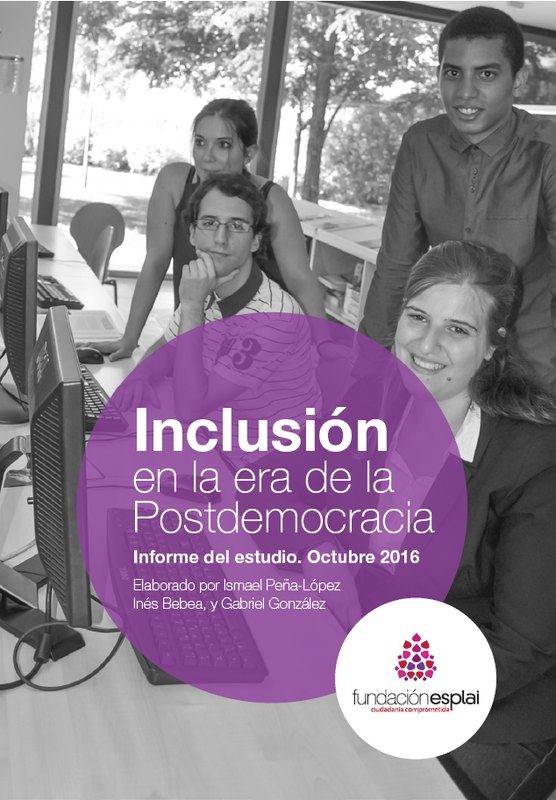 InÃ©s Bebea (from Ondula), Gabriel GonzÃ¡lez (from FundaciÃ³n Esplai) and I (with the help of Juan SÃ¡nchez, also from FundaciÃ³n Esplai) have just issued our report InclusiÃ³n en la era de la Postdemocracia (Inclusion in the age of post-democracy). The origins of the proposal “Inclusion in the age of postdemocracy” come from the debate held during the day of the plenary meeting of the Advisory Council of FundaciÃ³n Esplai on Committed Citizenship , held on January 20, 2015. In this debate took part the Advisory Board, the Board of Trustees and the technical team of the organization, and during the event the participants identified the challenges that technology is creating at the social level at the present time, and to which the FundaciÃ³n Esplai Foundation should respond in order to collaborate in the the construction of a technologically empowered citizenry that makes a critical, responsible and useful use in the pursue of their own personal development and that of one’s community. Present the state of the situation on the practices of active citizenship in the areas of health, education and democracy. Propose consensuses that group different actors and sensitivities towards a common strategy and action lines. Design action lines for the promotion of active citizenship based on an intensive, open and community-based use of ICTs. Between July and October 2016 FundaciÃ³n Esplai launched a proposal to study and debate the role that Information and Communication Technologies play in social inclusion and in the active exercise of citizenship, as essential tools for access to education, health and democratic participation. The work proposal, which emphasizes the analysis of the call third-level digital divide, included a participation process to which a broad sector of the citizenry was invited, especially those more linked to FundaciÃ³n Esplai initiatives: members of the Advisory Board, Board of Trustees and professional staff of the FundaciÃ³n Esplai, organizations of the of the Red Conecta and associated networks, professionals in the ICT sector, Education and Social Inclusion as well as private individuals interested in the topic. PeÃ±a-LÃ³pez, I., Bebea, I. & GonzÃ¡lez, G. (2017). InclusiÃ³n en la era de la Postdemocracia. Informe del estudio. Octubre 2016. El Prat de Llobregat: FundaciÃ³n Esplai. Peña-López, I. (2017) “Report. Inclusion in the age of post-democracy” In ICTlogy, #160, January 2017. Barcelona: ICTlogy. 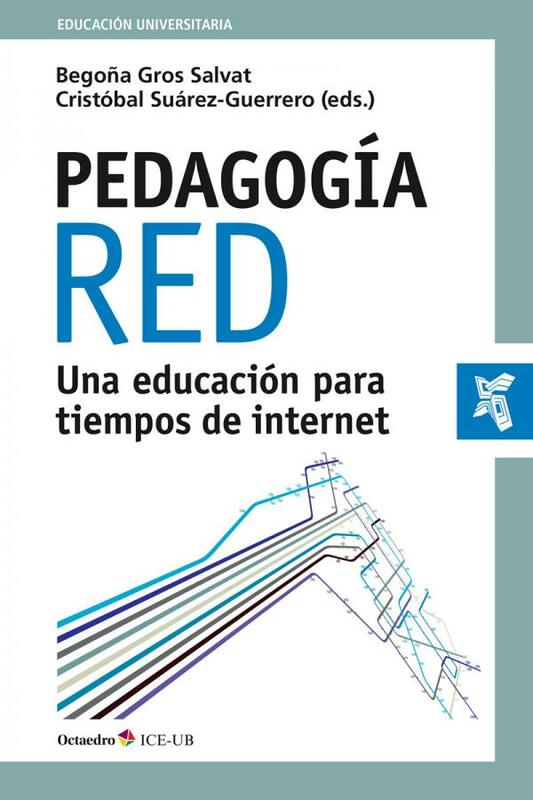 Professors BegoÃ±a Gros and CristÃ³bal SuÃ¡rez have edited a new book that has just been released, PedagogÃ­a red. Una educaciÃ³n para tiempos de internet (Networked pedagogy. An education for the Internet age). I have been invited to write a chapter for the book on how can we learn in networks or as networks. The easiest way to answer the question would have been to come up with a list of tools… which would have been outdated the day after the book saw the light. Instead, I focused on how “educational institutions” (understood in a very broad way: the textbook, the teacher, the classroom, the library, evaluation, etc.) could be opened, unfolded so that their momentum gathered along the years could be disrupted and actors and tasks profoundly changed. Besides thanking both BegoÃ±a Gros and CristÃ³bal SuÃ¡rez for their invitation, I also very heartily have to thank Toni Aguilar, as he was the first one to force me to think in this terms when he invited me to do the talk ICT and education:: evolution of education, revolution in learning , which I have repeatedly given after that — and finally became a book chapter, as now can be seen. GrÃ cies Toni! The book is in Spanish, the chapter is called Â¿Con quÃ© aprender en red? Estrategias y herramientas para la abertura y disrupciÃ³n de las instituciones educativas (Networked learning: strategies and tools to open and disrupt educational institutions) and here goes the abstract and the bibliography I used. Cuando se habla de quÃ© herramientas utilizar para aprender en red, es fÃ¡cil acabar utilizando la herramienta por la herramienta. A pesar de que nos repetimos a nosotros mismos cual mantra que las herramientas son solamente instrumentos para conseguir unos fines â€“ en este caso de aprendizaje â€“ nos ocurre una y otra vez que ponemos las herramientas en el lugar de los fines. Ello ocurre incluso en los casos donde nos dotamos de categorizaciones o de verdaderas ontologÃ­as para asignar cada herramienta al cajÃ³n del que solamente saldrÃ¡ cuando tengamos claro su papel instrumental. En este capÃ­tulo vamos a evitar caer en la tentaciÃ³n prescindiendo, por completo, de una caja de herramientas. O de una lista. O de una categorizaciÃ³n. Todo un reto para lo que, a primera vista, deberÃ­a ser un despliegue de estrategias y herramientas para el aprendizaje en red. En su lugar, nos centraremos en tejer la red de aprendizaje. Y lo haremos desmontando, desplegando, abriendo las instituciones que, hasta hoy, siguen protagonizado (y con mucho Ã©xito, no querrÃ­amos perder esto de vista) la enseÃ±anza. Y el aprendizaje, a menudo confinado a esas instituciones. MÃ¡s que en las herramientas, pues, queremos poner bajo el foco la disrupciÃ³n que las instituciones educativas estÃ¡n sufriendo y que, en parte, viene de la mano de determinadas estrategias y herramientas. Y es analizando las disrupciones que se estÃ¡n dando en el papel de 10 instituciones educativas que hemos seleccionando que veremos cÃ³mo actÃºan determinadas estrategias y herramientas. Baumgartner, P. (2004). â€œThe Zen Art of teaching â€“ Communication and Interactions in eEducationâ€. In Auer, M.E. & Auer, U. (Eds. ), Proceedings of the International Workshop ICL2004. Villach / Austria 29 September- 1 October 2004. Villach: Kassel University Press. Baumgartner, P. (2005). â€œHow to choose a Content Management Tool according to a Learning Modelâ€. In elearningeuropa.info, 17 May 2005. Brussels: European Commission. Blaschke, L.M. (2012). â€œHeutagogy and Lifelong Learning: A Review of Heutagogical Practice and Self-Determined Learningâ€. In International Review of Research in Open and Distributed Learning, 13 (1). Edmonton: Athabasca University. CastaÃ±eda, L. & Adell, J. (2013). â€œLa anatomÃ­a de los PLEsâ€. In CastaÃ±eda, L. & Adell, J. (Eds. ), Entornos Personales de Aprendizaje: claves para el ecosistema educativo en red, CapÃ­tulo 1, 11-27. Alcoy: Marfil. Castells, M. (2000). â€œMaterials for an exploratory theory of the network societyâ€. In British Journal of Sociology, Jan-Mar 2000, 51 (1), 5-24. London: Routledge. Castells, M. (2004). â€œInformationalism, Networks, And The Network Society: A Theoretical Blueprintâ€. In Castells, M. (Ed. ), The Network Society: A Cross-Cultural Perspective. Northampton, MA: Edward Elgar. Chen, L. & Chen, T. (2012). â€œUse of Twitter for formative evaluation: Reflections on trainer and traineesâ€™ experiencesâ€. In British Journal of Educational Technology, 43 (2). London: Wiley-Blackwell. D’Antoni, S. (Ed.) (2008). Open Educational Resources: the Way Forward. Paris: UNESCO. D’Antoni, S. & Savage, C. (Eds.) (2009). Open Educational Resources: Conversations in Cyberspace. Paris: UNESCO. de Haro, J.J. (2011). â€œMapas conceptuales sobre microblogging educativoâ€. In de Haro, J.J., Educativa. Blog sobre calidad e innovaciÃ³n en educaciÃ³n secundaria, Domingo 3 de abril de 2011. [online]: Juan JosÃ© de haro. DomÃ­nguez Figaredo, D. & Gil Jaurena, I. (2011). AcreditaciÃ³n de aprendizajes en escenarios formativos abiertos: AproximaciÃ³n conceptual al modelo de los ‘badges’. XII Congreso Internacional de TeorÃ­a de la EducaciÃ³n, 20-22 octubre 2011. Barcelona: Universitat de Barcelona. Ebner, M., Lienhardt, C., Rohs, M. & Meyer, I. (2010). â€œMicroblogs in Higher Education â€“ A chance to facilitate informal and process-oriented learning?â€. In Computers & Education, 55 (1), 92â€“100. London: Elsevier. Hase, S. & Kenyon, C. (2000). â€œFrom Andragogy to Heutagogyâ€. In ultiBASE In-Site, December 2000. Melbourne: RMIT. Hollands, F.M. & Tirthali, D. (2014). MOOCs: Expectations and Reality. New York: Center for Benefit-Cost Studies of Education Teachers College, Columbia University. Huang, W.D. & Nakazawa, K. (2010). â€œAn empirical analysis on how learners interact in wiki in a graduate level online courseâ€. In Interactive Learning Environments, 18 (3), 233-244. London: Routledge. Junco, R., Heiberger, G. & Loken, E. (2010). â€œThe effect of Twitter on college student engagement and gradesâ€. In Journal of Computer Assisted Learning, 27 (2), 119â€“132. Boston: Blackwell. Junco, R., Elavsky, C.M. & Heiberger, G. (2012). â€œPutting twitter to the test: Assessing outcomes for student collaboration, engagement and successâ€. In British Journal of Educational Technology, Articles in Press. London: Wiley-Blackwell. Levine, A., Lamb, B., Groom, J. & MinguillÃ³n, J. (2012). Analyzing and supporting interaction in complex scenarios: the case of DS106. Open Education Conference, October 16th, 2012. Vancouver: University of British Columbia. Meishar-Tal, H., Kurtz, G. & Pieterse, E. (2012). â€œFacebook Groups as LMS: A Case Studyâ€. In International Review of Research in Open and Distributed Learning, 13 (4). Edmonton: Athabasca University. PeÃ±a-LÃ³pez, I., CÃ³rcoles Briongos, C. & Casado MartÃ­nez, C. (2006). â€œEl Profesor 2.0: docencia e investigaciÃ³n desde la Redâ€. In UOC Papers, (3). Barcelona: UOC. PeÃ±a-LÃ³pez, I. (2007). â€œThe personal research portal: web 2.0 driven individual commitment with open access for developmentâ€. In Knowledge Management for Development Journal, 3 (1), 35-48. Amsterdam: KM4Dev Community. PeÃ±a-LÃ³pez, I. & Cerrillo i MartÃ­nez, A. (2011). â€œHerramientas 2.0 para el desarrollo de competencias profesionalizadorasâ€. In Cerrillo i MartÃ­nez, A. & Delgado GarcÃ­a, A.M. (Coords. ), Las TIC al servicio de la docencia del Derecho en el marco del EEES, 89-102. Actas de la II Jornada sobre Docencia del Derecho y TecnologÃ­as de la InformaciÃ³n y la ComunicaciÃ³n, 6 de junio de 2011. Barcelona: Huygens. PeÃ±a-LÃ³pez, I. & Cerrillo i MartÃ­nez, A. (2012). â€œMicroblogging en el aula. De la informaciÃ³n a la participaciÃ³nâ€. In Cerrillo i MartÃ­nez, A. & Delgado GarcÃ­a, A.M. (Coords. ), La innovaciÃ³n en la docencia del Derecho a travÃ©s del uso de las TIC, 143-157. Actas de la III Jornada sobre Docencia del Derecho y TecnologÃ­as de la InformaciÃ³n y la ComunicaciÃ³n, 8 de junio de 2012. Barcelona: Huygens. PeÃ±a-LÃ³pez, I. (2013a). â€œEl PLE de investigaciÃ³n-docencia: el aprendizaje como enseÃ±anzaâ€. In CastaÃ±eda, L. & Adell, J. (Eds. ), Entornos Personales de Aprendizaje: claves para el ecosistema educativo en red, CapÃ­tulo 6, 93-110. Alcoy: Marfil. PeÃ±a-LÃ³pez, I. (2013b). â€œHeavy switchers in translearning: From formal teaching to ubiquitous learningâ€. In On the Horizon, 21 (2), 127-137. Lincoln: NCB University Press. PeÃ±a-LÃ³pez, I. (2014). â€œInnovaciÃ³ social oberta: lâ€™organitzaciÃ³ polÃ­tica com a plataformaâ€. In Costa i FernÃ¡ndez, L. & PuntÃ­ Brun, M. (Eds. ), ComunicaciÃ³ pel canvi social. Reflexions i experiÃ¨ncies per una comunicaciÃ³ participativa, emancipadora i transparent, 59-75. Girona: Documenta Universitaria. PifarrÃ© Turmo, M., ArgelagÃ³s CastaÃ±, E. & Guijosa, Ã€. (2010). â€œUsing the Affordances of Wiki to Support Collaborative Argumentation in Secondary Science Educationâ€. In Beckett, D.S. (Ed. ), Secondary Education in the 21st Century, Chapter 1, 1-56. New York: Nova Science Publishers, Inc..
Stacey, P. (2014). â€œPedagogy of MOOCsâ€. In International Journal for Innovation and Quality and in Learning, (3), 112-115. Brussels: EFQUEL. Surowiecki, J. (2004). The Wisdom of Crowds: Why the Many Are Smarter Than the Few. London: Abacus. Tur, G. & Urbina RamÃ­rez, S. (2012). â€œPLE-based ePortfolios: Towards Empowering Student Teachersâ€™ PLEs through ePortfolio Processesâ€. In Pedro, L., The PLE Conference 2012 proceedings. 11st-13th July 2012, Aveiro | Melbourne. Aveiro, Melbourne: PLE Conference. Vivancos MartÃ­, J. (2008). La CompetÃ¨ncia digital i les TAC. ConferÃ¨ncia al Cicle de ConferÃ¨ncies. Vilafranca del PenedÃ¨s: CRP Alt PenedÃ¨s. Yousef, A.M.F., Chatti, M.A., Schroeder, U., Wosnitza, M. & Jakobs, H. (2014). â€œMOOCs – A Review of the State-of-the-Artâ€. In Zvacek, S., Restivo, M.T., Uhomoibni, J.O. & Helfert, M., CSEDU 2014 – Proceedings of the 6th International Conference on Computer Supported Education, Volume 3, 9-20. Barcelona: SciTePress. Zook, M.A., Graham, M., Shelton, T. & Gorman, S. (2010). â€œVolunteered Geographic Information and Crowdsourcing Disaster Relief: A Case Study of the Haitian Earthquake4â€. In World Medical & Health Policy, 2 (2), 7-33. Berkeley: Berkeley Electronic Press. Peña-López, I. (2016) “Book chapter. Networked learning: strategies and tools to open and disrupt educational institutions” In ICTlogy, #159, December 2016. Barcelona: ICTlogy. Peña-López, I. (2016) “eLearning Africa 2016 (VII). Back up for Online Tutors and Mentors” In ICTlogy, #152, May 2016. Barcelona: ICTlogy.